We've come a long way from when the first U.S. bikeshare opened in Washington, D.C. six years ago. There are now more than 125 programs around the country, and millions of miles are ridden each month on thousands of bikeshare bikes. Today, riders have to return bikes to docking stations, which is inconvenient when you're in a rush, or going somewhere far from a dock. Portland, Oregon, which launched a bikeshare system in July, lets riders park a bike anywhere in the city. Locks are built into the bikes so that they can be safely secured. There's a $2 charge for leaving a bike away from a docking station, but riders who return orphaned bikes to docking stations receive a $1 credit. If you're feeling tired or lazy, bikeshare isn't for you. Riding a bike is a workout -- and it can be especially grueling on hills. Bikeshare bikes tend to be heavy and have only a few gears. 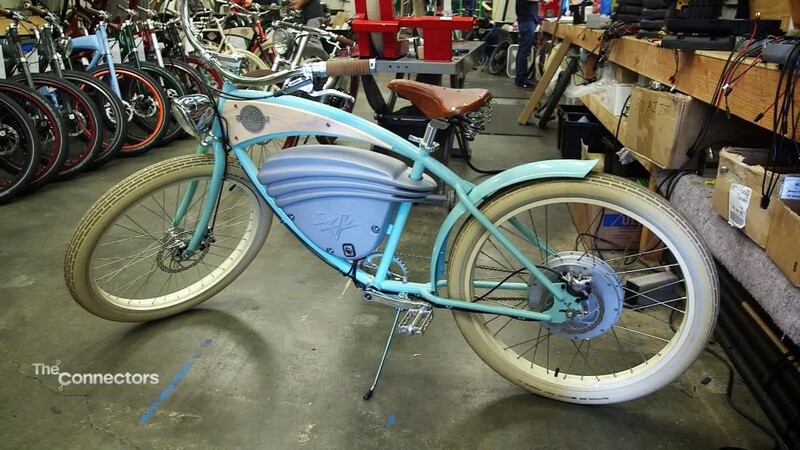 The bikeshare industry knows this, and is developing bikes with a built-in electric motor to make pedaling easier -- called ebikes for short. "That's where the market is going," said Ryan Rzepecki, the founder of Social Bicycles, which makes bikes for bikeshare networks around the country. "If we don't embrace it and invest in them aggressively we will lose the market." Related: Biking to work can be a sweaty disaster. Can this futuristic shirt help? Birmingham, Alabama, offers ebikes, and its pricing is comparable to other systems. Baltimore is launching a system with ebikes this fall. There will be no extra charge for taking an ebike. Prices haven't been announced yet, but will be modeled after Philadelphia, which offers monthly passes for $15 and 30-minute rides for $4. As car companies increasingly develop electric cars with better batteries, the bikeshare industry may benefit from lower battery prices. You probably already have a transit card to take public transportation where you live. But when a bikeshare system comes to town, you're generally forced to set up an entirely new account. Cities are realizing this is an inconvenience. 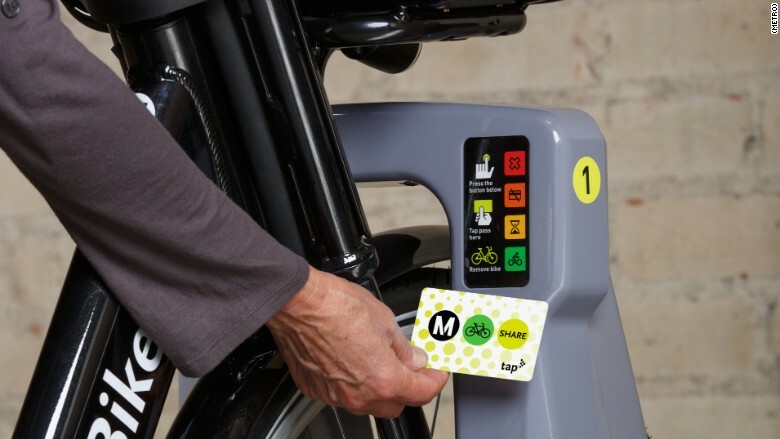 Los Angeles, which launched a system this summer, designed its network so anyone with a public transit card -- called TAP -- can use it to access the bike network. While commuters in most cities can purchase a single ride on a bus or light rail system for a couple dollars, the same isn't true of bicycles. Bikeshare networks have pushed a membership model, offering unlimited rides for a monthly or annual fee. Some cities have started to offer more variety. 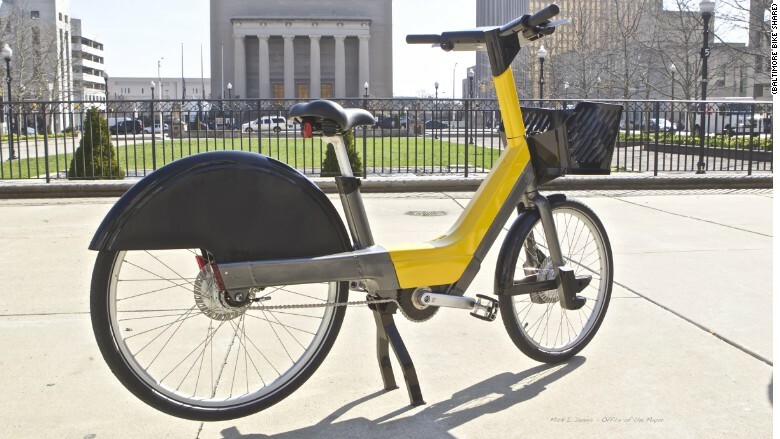 "Many of the early bikeshare systems just kind of brought over the pricing models that had worked in Europe," said David White, executive director of Pittsburgh Bike Share. "We really tried to break away from that." A single, 30-minute ride in Pittsburgh costs $2, aimed at being competitive with the bus, which is $2.50. Portland's bikes have an on-board computer so the city can track how and where people are riding. Portland will know the roads that are most popular with cyclists. This will help it to best identify where more bike infrastructure should be added. When riders sign up, they have the option of sharing their gender. 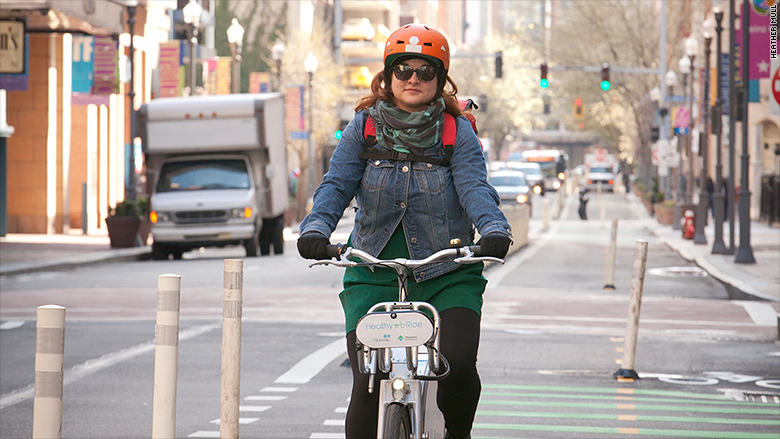 How many women ride in a city is seen in the transportation world as a strong indicator of how bike-friendly a city is. Studies have shown that women are generally more risk-averse than men, so are less likely to ride in dangerous conditions. Portland will be able to see the specific streets and times of day that are most appealing to female riders. Cash-strapped cities can struggle to fund a bikeshare network, especially one that's desirable enough that people choose a bike over their car. For Portland, finding a sponsor was the only way the system was going to launch, according to Leah Treat, Portland's transportation director. 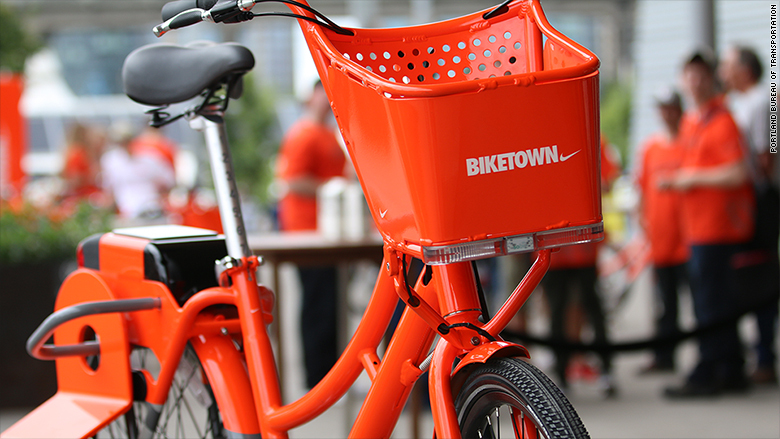 Now the city has sleek orange bikes covered in Nike swooshes. Having a company with expertise in marketing and advertising was also helpful to promote the system. "We have sneakerheads talking about bicycles," she said.